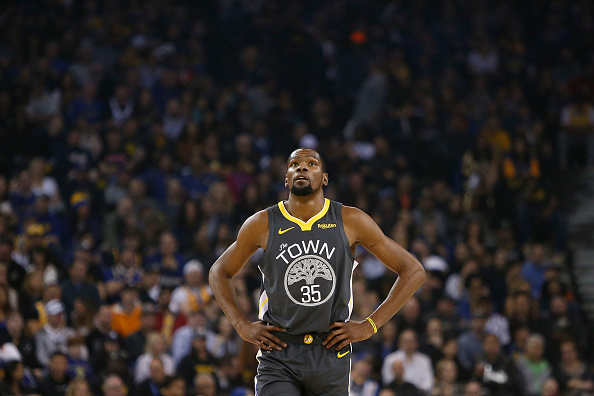 Home>Sports> Kevin Durant Rips Media: "I Dont' Trust None Of Y'all"
KD calls out reporters, specifically The Athletic's Ethan Strauss. Kevin Durant just wants to go to the gym, play ball and go home. 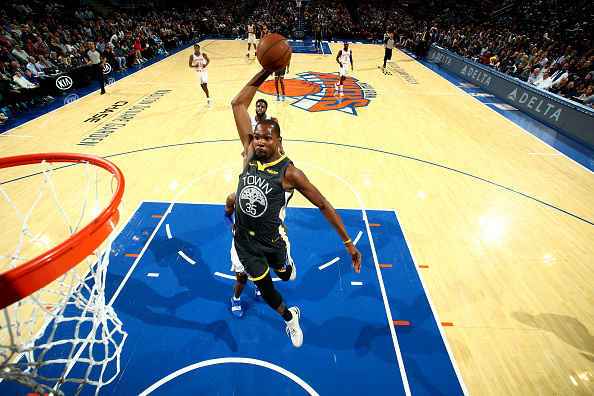 However, his pending free agency this Summer has put him at the center of speculation that this will be his final year with the Warriors before he joins the New York Knicks. Durant has avoided the media for weeks because of the free agency rumors, but last night he broke his silence. Particularly, KD called out The Athletic's Ethan Strauss, who noted that many around the league believe Durant is heading to the Knicks. "It's unnecessary," Durant said of all the speculation (H/T ESPN). "You got a dude, Ethan Strauss, who comes in here and just gives his whole opinion on stuff and makes it seem like it's coming from me. And he just walks around here, don't talk to nobody, just walk in here and survey and write something like that, and now you gotta pile on me because I don't wanna talk to y'all about that." "Come on, man. Grow up. Grow up. Yeah, you [looking at Strauss] -- grow up. Come on, bro. I come here and go to work every day. I don't cause no problems. I play the right way, or I try to play the right way. I try to be the best player I can be every possession. What's the problem? What am I doing to y'all?" "I have nothing to do with the Knicks," Durant said. "I don't know who traded Porzingis. They got nothing to do with me. I'm trying to play basketball. Y'all come in here every day, ask me about free agency, ask my teammates, my coaches. You rile up the fans about it. Let us play basketball. That's all I'm saying. And now when I don't wanna talk to y'all, it's a problem with me. "I just don't trust none of y'all," Durant said. "Every time I say something it's getting twisted up and thrown out and in so many different publications, trying to tear me down with my words that I say. So when I don't say nothing, it's a problem. I just wanna play ball. I wanna go to the gym and go home. That's all. Is that a problem? All right then." SPORTS Kevin Durant Rips Media: "I Dont' Trust None Of Y'all"